Big BIG FINISH Week: The Confessions Of Dorian Gray – THE HOUSES IN BETWEEN Review | Warped Factor - Words in the Key of Geek. For a work of art created to show us the importance of art for its own sake, and the refusal of art to compromise to the morality of any given day, Oscar Wilde might well have been amazed at what Dorian Gray has been able to teach us about the moral human experience in the century and more since he came to life on the page. The Confessions of Dorian Gray from Big Finish is a series that seems intent on exploring as many of those angles on morality as possible. Here in just its second episode, it gives us a discourse on guilt and forethought. When you sell your soul to the Devil, it asks, what happens to the souls of those you corrupt with whatever power you gain as a result, be it mesmerism, be it immortality, be it the preservation of your beauty? If you grow old without ever growing up, if you grow bored while determined to never become a bore to yourself, what happens to all those you cast aside along the way? Scott Harrison’s script for The Houses In Between shows us those consequences for Dorian, claiming in a Dickensian riff that those so ill-used are unable to find either Paradise, Hell or anywhere in between, except the world on which they suffered at his hands. The dead can talk to us in Dorian Gray’s world – and they really want a word with him. Alexander Vlahos matures from episode to episode, still speaking retrospectively, looking back on one period in Dorian’s history or another, as is appropriate to the confessional style. Here, he takes us to the 1940s, to Blitz-hit London, and his voice takes on a harder edge than it had in This World Our Hell, set some forty years earlier. He stands on the rooftops of London and watches, detached but fascinated as the city burns, as people die. He makes no moral judgment on the bombing whatsoever (it would after all be monstrously hypocritical were he to do so), but he seems to enjoy the show, Harrison taking the opportunity to remind us that once you divorce yourself from time, from the natural cycles of life and caring and ageing and death, the suffering of others can become entirely abstract to you. Even funny. Were Dorian one of us, he would doubtless be diagnosed as a sociopath at best, a psychopath possibly. But he’s not one of us. Not by a long way as he stalks the war-torn city, looking for answers to a mystery he finds in the flames. Harrison has the mystery come looking right back, and with the aid of flashbacks and a handy medium, we learn the story of how, in scenes not far removed from some in Wilde’s book, Dorian charmed a music hall singer in 1911, took her apparently genuine innocence, and corrupted her, leaving her to flounder and to die when he was bored of her. She’s the key to the whole notion of the souls we wrong coming back to literally haunt us, to demand retribution for those wrongs – the notion on which The Houses In Between is based. There’s something of Sapphire and Steel about the time-shifting action of this deep half-hour of your life, and something a little illogical in the resolution, where souls are burned by the fire of our human world, leaving Mr Immortality to walk away unscathed, but in terms of the philosophical questions it presents, The Houses In Between is a cracking way to spend an active half hour listening…and then about three hours pondering consequences. We all have people we’ve treated badly. Every harsh word, every ill-considered action has consequences, both to us and others. Dorian Gray is of course an extreme example, used to show up the principle involved, but the principle seems to be the need to sort things out, to make them right while we have the opportunity, because for us at least, time and opportunity are both finite. There are peripheral voices in The Houses In Between, but it would be fair to describe it as ‘mostly’ a two-hander between Vlahos and Lorna Rose Harris, who takes a double role here and, to her credit, differentiates the voices far enough to make you have to double-check. Vlahos, without ever losing himself, reins in the Welsh accent slightly in this second episode, allowing the scale of Gray’s age to come through, as well as his ego, his vanity, and even his snobbery. The second episode of the Confessions of Dorian Gray is a thoughtful half-hour that will stay with you long beyond its running time, and which hardens Gray, taking no prisoners and making no compromises on the way. He wins, and it’s almost inevitable that he does so, but you only half-cheer when he does, such is the moral ambiguity of his anti-hero nature. Part of us wants Dorian to pay for his blasé disregard for his fellow human beings, part of us thrills to see him beat the odds, escape the consequences, like a Scrooge who gets his spiritual visitations, changes not a jot and carries right on being a miserable skinflint. 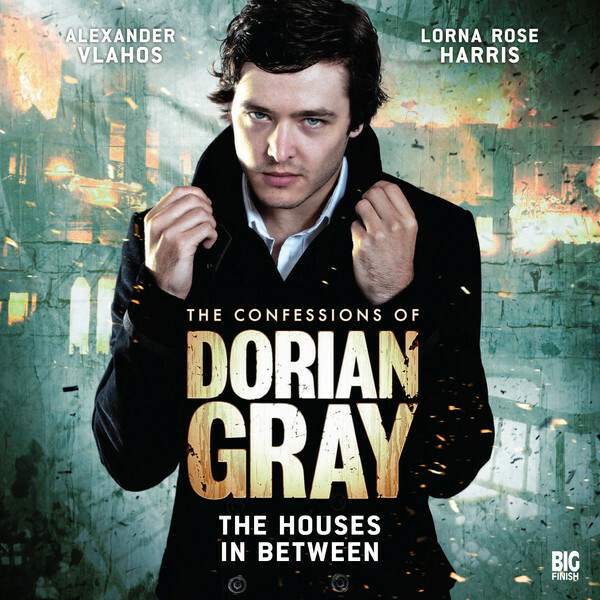 As Big Finish ranges go, Dorian Gray’s Confessions are shaping up to be among the most thought-provoking, as the challenging, immoveable anti-hero strides through time, without once refuting the bargain he made with the Devil, without even a real regret for the consequences of his long and ungoverned life. One of the pleasures about the time-hopping confessional format of course is that we’re never really sure where his life will take him next – we can only play the next episode and find out.